I am a fan of Irish cream and an even bigger fan of coffee,so something that can bring the two together is bound to be pretty tasty right? When we were on the lookout for Christmas cookies this year this is one of the recipes that we came across during our hunt and I knew we had to give them a try if for no other reason than I liked the way they sounded. A coffee flavored sugar cookie with and Irish cream butter cream meringue on top? Yes please! The recipe originally comes from the Cooking Channel and Nealey Dozier. For the coffee-flavored sugar cookies: In the bowl of a stand mixer fitted with the beater blade (or with a hand mixer), beat the butter, sugar and cream cheese on medium speed until light and fluffy, 4 to 5 minutes. Combine the vanilla, coffee extract and egg in a small bowl. Reduce the mixer speed to low; add the egg mixture to the butter mixture and beat until combined.In another bowl, stir together the flour, ground coffee, baking powder and salt. On low-speed, slowly add the dry ingredients to the butter mixture and mix until completely incorporated and a soft dough has formed. Place a rectangular sheet of parchment or wax paper on a clean surface. Pat the dough out into a rectangular shape on top of it. Cover with another sheet of parchment and roll the dough to 1/4- to 1/2-inch thickness. Remove the top sheet of parchment and transfer the dough to a baking sheet. Refrigerate for a minimum of 1 hour or overnight. Preheat the oven to 350 degrees F. Line two baking sheets with parchment paper or silicone baking mats. Cut the dough into rounds (or desired shape) using cookie or biscuit cutters. Transfer the cutouts to the baking sheets, spacing them about 2 inches apart. Gather the scraps, roll again and cut out more rounds (refrigerate to chill the dough if it gets too soft). Bake for 10 to 15 minutes, depending on thickness and shape. Do not let the cookies brown; start checking for doneness early. The finished cookies will have slightly golden brown bottoms, but they will feel very soft and under-baked until they cool. Hold the cookies on the baking sheets for 10 minutes, and then transfer to a wire rack to cool completely before frosting. For the Irish cream Italian meringue buttercream: In a small, heavy saucepan, stir together 1 cup of the sugar with 1/4 cup cold water to combine. Heat the mixture on medium-high heat. Dip a pastry brush in water and brush down the sides of the pan to remove any excess sugar, and then partially cover with a lid to prevent crystallization. Cook the sugar mixture until the temperature registers 245 degrees F on a candy thermometer. While the sugar mixture is heating, make the meringue. Place the egg whites in the bowl of a stand mixer fitted with the whisk attachment. Beat the egg whites on high-speed until medium peaks form. Slowly add the remaining 1/4 cup sugar and continue beating until stiff peaks form, about 5 minutes total. With the mixer running, slowly pour the hot syrup into the meringue. Continue beating at high-speed for 2 minutes. Reduce the speed to medium and beat until the meringue has cooled to room temperature and the bowl is cool to the touch, about 15 minutes. Transfer the buttercream frosting to a disposable piping bag fitted with a star or round tip. 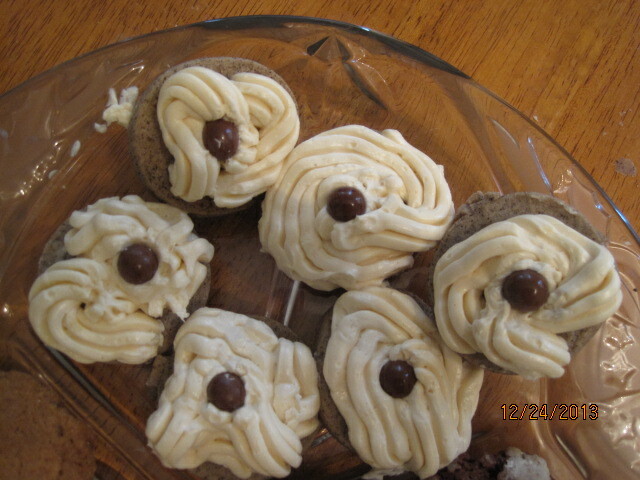 Pipe a layer of frosting onto each cookie and top with a chocolate-covered espresso bean. The recipe says it makes about 30 cookies, which we got. I have to tell you, this was a little tricky to do and we had some mishaps and restarts along the way, but the end results are pretty good. Coffee extract may not be easy to find in your area ( I know it isn’t easy in mine) and it took some hunting but we got it. The cookie itself can seem deceiving when you are making it because they are very soft even when they are done. They do harden up once they have cooled but you will keep checking yourself because you swear they aren’t finished. Trust me, when the time is done, they really are done! The meringue needs some careful watching too between making sugar syrup carefully to make sure it doesn’t get too hot and crystallize (which happened and I had to start again) to being convinced the meringue would never hold up because you are adding hot syrup to it (somehow it holds; I am no scientist, but I am glad it worked). The end results though is worth it. I think it is a great tasting cookie. You get great flavor from the cookie itself and the meringue is spectacular. That’s all I have for today. Check back next time for another recipe. There is still lots to come, and I do have some recipes I forgot to take pictures of (sorry about that) but I will still share them anyway, Until next time, enjoy the rest of your day and enjoy your meal!